offers practical recommendations for action. Systematic inquiry: evaluators conduct data-based inquiries that are thorough, methodical, and contextually relevant. Competence: evaluators provide skilled professional services to stakeholders. Integrity: evaluators behave with honesty and transparency in order to ensure the integrity of the evaluation. Respect for people: evaluators honour the dignity, well-being, and self-worth of individuals and acknowledge the influence of culture within and across groups. Common good and equity: evaluators strive to contribute to the common good and advancement of an equitable and just society. The question of how research ethics review processes should engage with evaluation research has not yet been definitively decided in many research institutions in Australia and New Zealand. Helen Kara’s article alerts us to the degree to which evaluation researchers encounters novel ethical issues. We shall explore some of the possible institutional approaches in a forthcoming Patreon resource. This is unusual in being thorough – there is much more explanation in the document – and up to date. The Australasian Evaluation Society (AES) has Guidelines for the Ethical Conduct of Evaluations which were last revised in 2013. This is a much more discursive document – 13 pages to the AEA’s four – which offers guidance to evaluation commissioners as well as evaluation researchers. The AES guidelines also refer to and include Indigenous ethical principles and priorities. In particular, reciprocity is highlighted as a specific principle to be followed. This is another difference from the AEA document in which Indigenous evaluation and evaluators are not mentioned. The United Nations Evaluation Group also specifies evaluation principles in its ethical guidelines (2008) but they are 10 years older than the AEA’s. Beyond these, there are few codes of ethics, or equivalent, readily available from national and international evaluation bodies. Also, evaluation research rarely comes within the purview of human research ethics committees unless it’s being conducted within a university or a health service. And books on evaluation research rarely mention ethics. Recent research has shown that a proportion of evaluation researchers will assert that ethics does not apply to evaluation and that they have never encountered ethical difficulties in their work (Morris, 2015, p.32; Williams, 2016, p.545). This seems very odd to me, as I have been doing evaluation research for the last 20 years and I have encountered ethical difficulties in every project. It also seems worrying as I wonder whether the next generation of evaluation researchers are learning to believe that they do not need to think about ethics. In my recent book, Research Ethics in the Real World (2018), I demonstrated that ethical issues exist at all stages of the research process, from the initial idea for a research question up to and including aftercare. This applies to evaluation research just as much as it does to any other kind of research. I also demonstrated that there are some ethical considerations at the macro level for evaluation research, such as funding, stakeholder involvement, and publishing. Well-funded organisations or projects can allocate money for evaluation; poorly-funded ones cannot. This means that evaluation research is routinely done where funding is available rather than where evaluation is most needed. In the United Kingdom, where I am based, we have been undergoing an ideological programme of austerity involving massive cuts to public services over the last nine years. This has come from successive governments that have also prioritised evaluation research, funding expensive national ‘What Works’ centres on themes such as ageing, health, and childhood, right through the austerity years. Yet to the best of my knowledge there has been no evaluation of the impact of any service closure. This seems short-sighted at best – though it does illustrate my point that evaluation happens where money is being spent. Also, an explicit purpose of evaluation research is often to provide evidence to use in future funding negotiations, which means that results are effectively expected to be positive. This means that pressures associated with funding can introduce bias into evaluation research right from the start. Combine this with an evaluator who needs to be paid for their work in order to pay their own bills, and you have a situation that is well on its way to being a money-fuelled toxic mess. Involving stakeholders is a key principle of evaluation research. The AEA define ‘stakeholders’ as ‘individuals, groups, or organizations served by, or with a legitimate interest in, an evaluation including those who might be affected by an evaluation’ and suggest that evaluators should communicate with stakeholders about all aspects of the evaluation (2018). Again, here, the use of a single word implies homogeneity when in fact evaluation stakeholders may range from Government ministers to some of the most marginalised people in society. This can make involving them difficult: some will be too busy to be involved, some will be impossible to find, and some will not want to be involved. Which leaves evaluators caught between an impractical principle and an unprincipled practice. There is some good practice in stakeholder involvement (Cartland, Ruch-Ross and Mason, 2012:171-177), but there is also a great deal of tokenism which is not ethical (Kara, 2018:63). Also, even when all groups of stakeholders are effectively engaged, this can bring new ethical problems. For example, their values and interests may be in conflict which can be challenging to manage, particularly alongside the inevitable power imbalances. Even if stakeholders work well together such that power imbalances are reduced within the evaluation, it is unlikely those reductions will carry over into the wider world. Commissioners of evaluation are reluctant to publish reports unless they are overwhelmingly positive. I had an example of this some years ago when I evaluated an innovative pilot project tackling substance misuse. From the start my client said they were keen to publish the evaluation report. I worked with stakeholders to collect and analyse my data and made around 10 recommendations, all but one of which said words to the effect of ‘good job, carry on’. Just one recommendation offered constructive criticism of one aspect of the project and made suggestions for improvement. My client asked me to remove that recommendation; I thought about it carefully but in the end refused because it was fully supported by the evaluation data. We had two more meetings about it and in the end, my client decided that they would not publish the report. This was unfortunate because others could have learned from the evaluation findings and methods, and because failure to publish increases the risk of work being duplicated which results in public funds being wasted. Sadly, as a commissioned researcher, I had signed away my intellectual property so it was out of my hands. Everyone involved in evaluation research can tell these kinds of tales. However, it is too simplistic to suggest that publication should always be a requirement. In some cases, the publication could be harmful, such as when a critical evaluation might lead to the economy of service closure, to the detriment of service users and staff, rather than to more resource-intensive improvements in policy and practice. But overall, unless there is a good reason to withhold a report, the publication is the ethical route. As the AEA principles suggest, evaluation researchers are in a good position to help increase social justice by influencing evaluation stakeholders to become more ethical. I would argue that there are several compelling reasons, outlined above, why all evaluation researchers should learn to think and act ethically. American Evaluation Association (2018) Guiding Principles. Washington, DC: American Evaluation Association. Cartland, J., Ruch-Ross, H. and Mason, M. (2012) Engaging community researchers in evaluation: looking at the experiences of community partners in school-based projects in the US. In Goodson, L. and Phillimore, J. (eds) Community Research for Participation: From Theory to Method, pp 169-184. Bristol, UK: Policy Press. Kara, H. (2018) Research Ethics in the Real World: Euro-Western and Indigenous Perspectives. Bristol, UK: Policy Press. Morris, M. (2015) Research on evaluation ethics: reflections and an agenda. In Brandon, P. (ed) Research on evaluation: new directions for evaluation, 31–42. Hoboken, NJ: Wiley. Williams, L. (2016) Ethics in international development evaluation and research: what is the problem, why does it matter and what can we do about it? Journal of Development Effectiveness 8(4) 535–52. DOI: 10.1080/19439342.2016.1244700. Morris, M. (ed) (2008) Evaluation Ethics for Best Practice: Cases and Commentaries. New York, NY: The Guilford Press. Donaldson, S. and Picciotto, R. (eds) (2016) Evaluation for an Equitable Society. Charlotte, NC: Information Age Publishing, Inc. In this issues of the Research Ethics Monthly, Ian Pieper and Colin Thomson continue their series of short summaries of each of their four co-authored articles on the principles that underpin the Australian National Statement, namely, research merit and integrity, justice, beneficence and respect. The articles were originally published in the Monash Bioethics Review and remain available to subscription holders to that journal. The publisher, Springer, has generously agreed to place each of the four articles on Free Access for one month after the corresponding short summary is published in the Research Ethics Monthly. Last month they revisited their paper entitledBeneficence as a Principle in Human Research. This month they revisit the paper exploring the principle of respect for humans in the context of human research. The full paper can be found here. Respect for human beings is an essential component of human research ethics. It was emphasised in the Nuremberg code and has been continually recognised in all authoritative international and national guidelines since then. Although primarily reflected in requirements for consent, the central concept is respect for personal autonomy, that is, for the capacity of individuals to be able to put their principles and values into practice. Sometimes the concept of dignity is added, recognising respect for a person’s ability to live in accordance with their desires and values and requiring more than a focus merely on consent. Individual autonomy has both a volitional component, requiring a decision to be voluntary and not made under compulsion, threats or coercion, and a cognitive component requiring a decisionmaker to have both the capacity and sufficient information to make a decision. It is important that all stakeholders involved in assessing consent in human research understand these foundational elements of ethically sound consent. This paper outlines and discusses the guidance provided within the National Statement around what is sufficient information and how that should be disclosed, the need for adequate understanding, the assessment of capacity and the requirement of voluntariness including the relevance to decision-makers of relationships with others. The discussion of capacity includes consideration of circumstances involving children, people dependent on medical care or who may have cognitive impairments. The requirement of voluntary choice and possible impacts from coercion, inducement, dependency, and vulnerability are examined. In this context, the paper offers a reminder that respect requires more than a focus on consent. It explores circumstances where a limited disclosure or waiver of the requirement for consent can be granted in order to facilitate important research in ways that are ethically justified. Ian and Colin have produced an activity sheet to accompany this post. It can be found in the subscribers’ area (https://www.patreon.com/ahrecs). A subscription of only USD15/month (approx AUD21/month) provides access to a growing library of activity items, reflections on papers and news, and other resource items. At least two items are added to the library every month. These are shared on a creative commons basis, so you are free to use them internally without otherwise engaging AHRECS. These items would ordinarily cost more than AUD500. So becoming an AHRECS patron not only helps AHRECS stay a constructive voice for change it’s a way to get access some terrific items for a great price. Email gary.allen@ahrecs.com for further information. 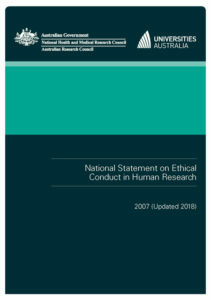 The revised National Statement on Ethical Conduct in Human Research 2007 (updated 2018) was released on 9 July 2018. The National Statement consists of a series of guidelines made in accordance with the National Health and Medical Research Council Act 1992 and is subject to rolling review. This means that parts of the National Statement are updated as needed, in accordance with strategic planning, or in response to user feedback or national or international developments in research or ethics. Since 2007, Section 3 of the National Statement has addressed ethical considerations specific to research methods or fields. The 2018 revision provides a new structure for Section 3, based on the elements of a research project (from conception to post-completion). The revised Section 3 begins with a chapter that addresses ethical issues in all research, followed by specialised guidance for research involving human biospecimens, genomics and xenotransplantation. This approach emphasises that researchers, Human Research Ethics Committees (HRECs) and other users of the National Statement must take account of the principles and major themes in research ethics addressed in Sections 1 and 2 of the document as the foundation of the guidance in Section 3 and then, in turn, consider the guidance provided in Chapter 3.1 as a base for the guidance provided in the other chapters included in this section. While significant changes have been made to all aspects of the guidance provided in Section 3, we note, in particular, the additional guidance that has been provided in relation to collection, use and management of data and information and to management of the findings or results arising from genomic research. As part of this update, changes have also been made to Chapters 5.1, 5.2 and 5.5 in Section 5, the Glossary and the Index as a consequence of the revisions to Section 3. Revisions to the National Statement were informed by working committees and through public consultation in accordance with requirements of the National Health and Medical Research Council Act 1992. All users of the National Statement, including HRECs, research offices and researchers are expected to ensure that the current version of the National Statement is being used in developing research proposals, making submissions for ethics review and undertaking ethics review. However, as a consequence of the scope of the revisions to Section 3, we expect that users of the National Statement will gradually integrate these revisions into their proposals, submissions and review over the period from July to December 2018, with full implementation expected by 1 January 2019. This timeline is intended to give researchers and HRECs an opportunity to familiarise themselves with the new guidance prior to the revocation of the version of the National Statement updated, most recently, in 2015. To facilitate this transition, both the current version of the National Statement and the updated version are available on the NHMRC website at http://nhmrc.gov.au/guidelines/publications/e72. Use of the National Statement is also linked to the Human Research Ethics Application (HREA), released in December 2016 to replace the National Ethics Application Form. To coincide with the release of the revised National Statement, questions in the HREA will require revision and users of the HREA will be advised when the revised HREA is online. Institutions and HRECs are encouraged to allow a transition period for researchers while the revisions to the HREA take effect. The provision of a transition period, how it will be managed and its timeframe are at the discretion of individual Institutions/HRECs. Australia’s research integrity framework is underpinned by three national standards developed by NHMRC and its co-authors, the Australian Research Council (ARC) and Universities Australia (UA). Together these three standards provide guidance on responsible and ethical research conduct for both humans and animals. The overarching document is the Australian Code for the Responsible Conduct of Research, 2018. The Code is the leading reference for researchers and institutions across all disciplines about the expectations for responsible research conduct and the handling of investigations into research misconduct. After 10 years in operation, the Code has been reviewed and the 2018 edition was released in June 2018. The other two documents are the National Statement and the Australian code for the care and use of animals for scientific purposes (also endorsed by CSIRO). AHRECS (While we know it predated the recent work on s3) What drove the decision to conduct a rolling review, rather than a review of the entire document? NHMRC During the revision of the National Statement that was completed in 2007, it was determined that a more flexible, more efficient approach to revising the document would be a good innovation. We wanted to be able to both respond to the needs of users for more limited changes – from a word, to a paragraph, to a single chapter – without having to review the whole document and to be able to integrate or modify the content in response to changes nationally or internationally in research, research ethics or government regulation. Review of the 1999 National Statement took three years from start to finish and we thought we could improve on that timeline! We have found that this approach has, in practice, enabled us to make both minor changes and significant changes to single chapters of the document, as well as to review one of the five sections of the document, as we have just done. AHRECS Are there downsides to that approach? NHMRC Yes, there are. The major downside is that the document is ‘of a piece’ and changes to any one part of the document invariably require consideration of changes to the other parts, not just in terms of cross-referencing, but in terms of the content itself. This issue of ‘consequential effect’ manifests itself in the need to ensure consistency in our guidance and to consider the impact on the whole document of more philosophical or conceptual changes that have been introduced by the changes. An example in the most recent revision of Section 3 is that our approach to interventional research in Section 3 had a ‘flow on’ effect to Section 5 in terms of where certain guidance belonged, how that guidance should reflect changes in the clinical research sector since 2007 and how it should reflect other guidance documents (e.g. related to safety reporting) that NHMRC has published in the last 12 months. AHRECS What were you hoping to accomplish with the changes to section 3 (and Section 5 + the Glossary)? Was it achieved? NHMRC Principally, we were hoping to facilitate a re-thinking on the part of users (researchers and HRECs, primarily) regarding how they conceptualise and address ethical issues in the design, review and conduct of the research. We began with a decision to abandon the idea of ‘categories’ or ‘types’ of research as the main way to package this guidance and to focus on the reality that most ethics guidance applies to ALL research, thereby requiring ALL researchers to consider it, rather than just going to their specialised chapter of the document and, potentially, ignoring the broader issues. We then settled on the ‘life cycle’ of a research project as the best structure – that is, from conception to post-completion stages of a research project. This also enabled us to see more clearly what was not general guidance and encapsulate that extra guidance in separate, specialised chapters that each required consideration of the general guidance as a prerequisite to fully understanding and implementing the specialised guidance content. The changes that we made to Section 5 and the Glossary were a direct consequence of the revision of Section 3 and we purposefully did not introduce changes to those parts of the document that were independent of the Section 3 revision, even though it was pretty tempting to do so sometimes. We do think that we achieved our objectives and we are very satisfied with the results of the review process. AHRECS If you could say just one thing about the work to date what it be? NHMRC Review of the National Statement, while challenging, involves very stimulating and satisfying dialogue with lots of researchers, reviewers and other users of the document. We are so committed to it that we are almost immediately taking on the review of Section 4 and Section 5 – so, watch this space! AHRECS When someone says they would have liked examples to better illustrate the new concepts in the update how do you respond? NHMRC A weaselly response would be: it depends on which new concepts you are talking about; but, to use one example, a good look at Chapter 3.3: Genomic research and the Decision tree for the management of findings in genomic research and health care that we included (on page 52) to address this complex issue provides just such an attempt to illustrate by example. The main impediment to using examples or case studies to illustrate concepts is the difficulty of deciding which concepts to illustrate and with how many examples, as well as potentially expanding the size of the document exponentially in order to do the examples justice. AHRECS When will a html version be available online? At present, the 2007 version of the National Statement (updated May 2015) is available in both PDF and HTML format; whereas the version updated 2018 is only available in PDF. We are not 100% sure when the HTML version of the National Statement (updated 2018) will be available, but we anticipate within the next two to three months. Please also note that the current address (https://beta.nhmrc.gov.au/about-us/publications/national-statement-ethical-conduct-human-research-2007-updated-2018#block-views-block-file-attachments-content-block-1) is only temporary, which means that you’ll need to update your bookmarks/links again when the final version of the new NHMRC website is released in late August or early September. This blog will provide a discussion of issues present in deidentifying marginalised research participants, or research participants who request to be identified, in the publication of qualitative research. As my research is mixed-method (quantitative and multi-method qualitative) it included several data collection techniques and analyses. For this discussion, I will specifically focus on the face-to-face and Skype interviews I conducted with participants in Russia and the United States. My PhD study investigates intergenerational transmission of combat-related trauma from parent to child, focusing on the Soviet–Afghan war, 1979–89. This research includes interviews with Soviet veterans and family members of veterans; it was these interviews that raised questions of participant erasure and agency. From 12 face-to-face and Skype interview participants, one participant requested complete deidentification; one requested that their real name not be used but their location and other identifying details remain; two participants requested that only their first names be used and their location and other identifying details remain; the eight remaining participants requested that they be fully identified, with some participants sending me photographs of them and their families for inclusion in research publications. Given the social and political sensitivity that persists in Eastern Europe around the discussion of the Soviet invasion into Afghanistan, I had to consider and discuss with participants that requested they be identified the issue of their safety. Given academic broad-stroke standards of deidentifying research participants, we must review the ethics of this practice as it can promote and perpetuate erasure of marginalised participants and the silencing of their voices. Some textbooks on the topic of ethics in the social sciences approach anonymity and deidentification of participants from the angle that anonymity is part of the basic expectations of a research participant, without elaborating that anonymity is not always desirable nor ethical (see for example Ransome 2013), essentially replicating the medical model of human research ethics developed for the regulation of biomedical research in the United States (Dingwall 2016, p.25). Such an approach does not address the issues of presenting anonymity as a status-quo in social research, and makes a sweeping – and a Western academic – generalisation that anonymity is one of the vital assurances researchers must give to their participants to keep within their duty of care (that is, that researchers have at least some obligation to care for their research participants). This approach to research ethics negates participant agency, particularly those participants that request they be identified in research. Furthermore, forced anonymity can be an act of disrespecting participants (Mattingly 2005, p.455–456) who may have already experienced invisibility and who are then further erased through anonymity by researchers (Scarth & Schafer 2016, p.86); for example, “in some Australian and, in particular, some Indigenous cultures, failing to name sources is both a mark of disrespect and a sign of poor research practice” (Israel, Allen & Thomson 2016, p.296). As researchers, we must also question if presenting this approach as a vital tenet of social research can become a damaging rule-of-thumb for new researchers who might, therefore, not question the potential undermining of participant agency, and use deidentification unethically as a sweeping regulation within their research without consideration for the individual situations of their research participants. This is part of the issue created by applying a medical model of ethics assessment processes to the social sciences, in which the prevailing interpretation is that deidentification is also required within social research, whereas the reality is that specific agreements between the researcher and the research participant must be honoured. The ethical dilemma, therefore is: can researchers ethically deidentify participants at the expense of the participants’ agency, potentially perpetuating the historical and symbolic erasure of their voices and experiences? I argue that, based on research design and data collection methods, this decision-making process is an ‘ethics in practice’ and must be approached in context, individually for each study, and for each individual participant. As scholars, we want to minimise or eradicate harm that might come to our participants through our research. While we think “in advance about how to protect those who are brought into the study” (Tolich 2016, p.30) this must be a continual process throughout our project, in which we “work out the meaning of what constitutes ethical research and human rights in a particular context” (Breckenridge, James & Jops 2016, p.169; also see Ntseane 2009). This is important to note, because protection does not only refer to participants but also to others connected to them. For example, the use of a real name at the request of a participant may expose their family member(s) who were not part of the research. Consequentialist approaches to ethics suggest that “an action can be considered morally right or obligatory if it will produce the greater possible balance of good over evil” (Israel, 2015: 10; also see Reynolds, 1979). This is an approach we could take to issues around deidentification; however, this also means that researchers must know what is good or bad. In studies like mine, this would mean knowing (or making an attempt, or an assumption to know) what is good or bad for my research participants. This action is infantilising, and places the researcher above the research participant by making the final call ourselves, which is to remove participant agency – if we can assume participants are autonomous during the research consent process, we must also assume that they are autonomous in making decisions with respect to their identification (Said 2016, p.212). Additionally, this action may be culturally insensitive given that Western human research ethics committees follow Western cultural guidelines, centring the dominance of Western academia. The ethical issues I faced during my PhD research highlight why researchers cannot take a sweeping approach to deidentification in qualitative research – not even for a single study. ‘Ethics in practice’ means that each participant’s situation is analysed individually, and issues around erasure, safety, and their agency weighed against each other to reach a conclusion. I propose that if this conclusion is at odds with the preference of the participant, that it must then be taken back to the participant for further discussion. Not implementing this aspect of ‘ethics in practice’ goes against social science ethics, that we must avoid doing long-term and systemic harm, both of which come through erasure and silencing. We must also remember that “any research project has the potential to further disenfranchise vulnerable groups” (Breckenridge, James & Jops 2016, p.169), and ignoring the wishes of participants regarding their identification due to a Western model of ethics can cause further damage to these groups. Aleksievich, S., Whitby, J. & Whitby, R. 1992, Zinky Boys: Soviet voices from a forgotten war, Chatto & Windus, London. Breckenridge, J., James, K. & Jops, P. 2016, ‘Rights, relationship and reciprocity: Ethical research practice with refugee women from Burma and New Delhi, India’, in K. Nakray, M. Alston & K. Whittenbury (eds), Social Sciences Research Ethics for a Globalizing World: Interdisciplinary and Cross-Cultural Perspectives, Routledge, New York, pp. 167–186. Dingwall, R. 2016, ‘The social costs of ethics regulation’, in W.C. van den Hoonaard & A. Hamilton (eds),The Ethics Rupture, University of Toronto Press, Toronto, pp. 25–42. Israel, M., Allen, G. & Thomson, C. 2016, ‘Australian research ethics governance: Plotting the demise of the adversarial culture’, in W.C. van der Hoonaard & A. Hamilton (eds),The Ethics Rupture, University of Toronto Press, Toronto, pp. 285–216. Mattingly, C. 2005, ‘Toward a vulnerable ethics of research practice’, Health: An Inderdisciplinary Journal for the Social Study of Health, Illness and Medicine, vol. 9, no. 4, pp. 453–471. Ntseane, P.G. 2009, ‘The ethics of the researcher-subject relationship: Experiences from the field’, in D.M. Mertens & P.E. Ginsberg (eds), The Handbook of Social Research Ethics, 1st edn, Sage, Thousand Oaks, pp. 295–307. Ransome, P. 2013, ‘Social research and professional codes of ethics’, Ethics and Values in Social Research, Palgrave Macmillan, Basingstoke, pp. 24–53. Said, D.G. 2016, ‘Transforming the lens of vulnerability: Human agency as an ethical consideration in research with refugees’, in K. Nakray, M. Alston & K. Whittenbury (eds),Social Sciences Research Ethics for a Globalizing World: Interdisciplinary and Cross-Cultural Perspectives, Routledge, New York, pp. 208–222. Scarth, B. & Schafer, C. 2016, ‘Resilient Vulnerabilities: Bereaved Persons Discuss Their Experience of Participating in Thanatology Research’, in M. Tolich (ed. ), Qualitative Ethics in Practice, Left Coast Press, Walnut Creek, CA, pp. 85–98. ‘Tolich, M. 2016, ‘Contemporary Ethical Dilemmas in Qualitative Research’, in M. Tolich (ed. ), Qualitative Ethics in Practice, Left Coast Press, Walnut Creek, CA, pp. 25–32.